Coral Sports is a British bookmaker with a long history. In 1926 founder Joe Coral started the company with a focus on horse-race betting. When betting shops were legalized in 1961 Coral started opening shops all over the UK, making them one of the pioneers of the gambling industry. 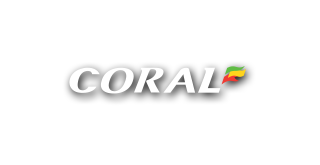 Since 1981 the company transferred hands several times until 1999 when Coral’s online gambling and modern success began. The Coral group has more than 1700 betting shops all over the UK and several more in Italy operating as Eurobet. They offer a wide range of online betting. Coral Rakeback is one of the best Poker Deals out there. They are the No.1 address in England when it comes to great bonuses and free bets. The website and customer support are only operated in English but offer a wide range of safe deposit and withdrawal options. As part of the iPoker Network Coral uses Playtech’ sophisticated poker software. Coral offers very good traffic for all available poker games, great bonuses, and promotions as well as first class customer support. Paired with our exclusive promotions, Coral Poker is one of the best places to play on the iPoker network. You should definitely give them a try! Coral Poker site offers an incredible and complete poker experience. There are a wide number of tournaments including fire sit and go and WSOP satellite to be enjoyed. Coral Poker site suits both high and low roller players. It is also a poker site that is suitable for regular and new players alike. The various poker games start from as low as €0.10. For serious poker players, there are buy-ins that have a value of up to €155. There are also poker tournaments in addition to the buy-ins. At the Coral Poker Rooms, players can play for real cash directly from their bankroll. Coral Poker is available on the downloadable software. You can also play from the instant play software where you can play directly from your PC. If you are looking for a high rakeback deal, then Coral Poker is a fantastic choice. Combined our exclusive YourPokerDream Promotion, the Coral Rakeback Deal is one of the best deals you can find in the net. The Coral standard rakeback program gives you up to 30% Rakeback and with all other promotions and the help of YourPokerDream players can reach even much more. All players who sign up at CoralPoker through YPD will get access to our 25k Main Rake Race and as well to our 5k iPoker Race. You’ll find a detailed overview about all available promotions at the end of this article. Contact please our support team in skype or by email if you would like to negotiate a special VIP Rakeback Deal. Coral Poker is one of the best poker sites for promotions and bonuses. They offer welcome bonuses for newly registered members in the casino, and have a suite of other Pokemon-themed bonuses. The Coral Poker site is among the best in terms of great value poker. For poker players that love quick thrills there are half-time Texas Hold’em Speed Poker tournaments that get the heart racing. There are also twister poker tables for players who love poker games with a twist. In twister poker tables, three players play to earn a prize that is largely determined by a spinner. You can play from as low as €2 to as high as €1000 and multiply your buy-in within minutes up to 1.000 times.. There is also the Six plus Hold’em poker game where the deck is reduced to 36 from the ordinary 52 deck. This means that the 2 to 5 cards are taken out of the deck offering the player higher hands each game, and increasing the stakes through tighter hands. You find here all possible payments methods. All payouts are processed very quickly by CoralPoker and it only takes 12-24 hours on average. These cash games, also known as ring games allow players to play with real money. In ring games player’s have the opportunity to choose the amount they wish to play with. Coral ring poker games have limits to the amount players can play the game for- players buy-in within a set minimum and maximum range. These games range in blind-size from a minimum of €35 big blinds to a maximum of €100 big blinds. As a poker player playing the ring game, you are only allowed to use the chips in front of you when betting. For the duration of the poker game you cannot purchase extra chips. You can join a table with an extra seat even when the game is on-going, and you can leave the poker table whenever you choose. There are two types of poker tournaments. The Sit and Go and the Multi-Table Tournaments. There are a maximum number of entrants allowed at the SNG tournaments. When the maximum number is reached the poker tournament begins. The Multi-Table Tournaments begin at the stated specific time irregardless of the number of poker players at the table. Every poker player at the tournament is given the same number of chips and also the same buys in. Players can enjoy poker games from Coral Poker on-the-go. Coral Poker’s has a dedicated mobile app that can be accessed through near every operating system including Windows, Android, Mac, Linux, and IOS. Coral Poker has a great customer support team to answer any questions and help you when facing difficulties with their platform. You can reach their support team 24/7 by email, telephone and also over a live chat. UK, Gibraltar, Rep of Ireland, Aland Islands, Albania, Argentina, Austria, Belarus, Croatia, Czech Republic, Georgia, Guernsey, Iceland, Isle of Man, Jersey, Liechtenstein, Lithuania, Luxembourg, Macedonia, Malta, Netherlands, New Zealand, Saint Kitts and Nevis, San Marino, Slovakia, Slovenia. Coral Poker is a fantastic poker room that offers all famous online poker games and a lot of players at all limits. The software is stable and the rakeback deal is one of the best you can find on the net. Coral is one of the biggest operator in UK and a very good choice for players from all over the world. The only downside is that Coral limits access to a small number of countries. 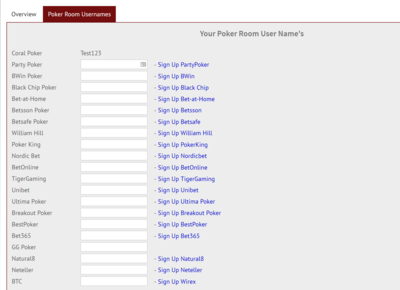 How to sign up correctly via YourPokerDream at Coral Poker? Step4: After you’ve successfully signed up for Coral Poker, all you have to do is log in to your YourPokerDream account and enter the username which you have chosen at Bwin and press “save changes”. From this point on, everything will run automatically and you can use all exclusive offers from YourPokerDream in addition to the normal offers of Coral Poker.